Yesterday at lunch my son and I were having a major discussion (that included math) over the check and tip. As I was explaining my thinking, the conversation took an unexpected turn. Son: Mom, did you just do all that math in your head? Son: Wow. If I were a zombie I'd totally eat your brain first. A strange compliment if I ever heard one, but I know exactly what his 13 year old mind was thinking! That conversation got me thinking about zombies and poetry. (Yes, I know my mind works in strange ways!) 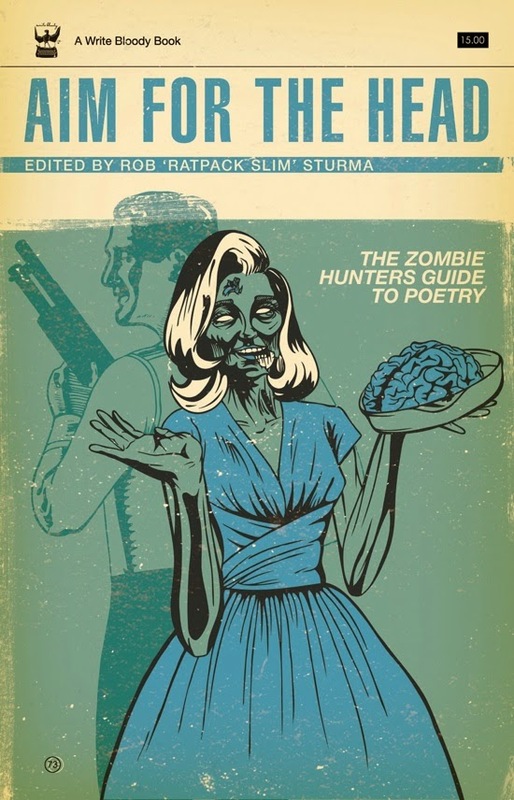 Did you know there was a book of zombie poetry? You can download a free sample. You can also listen to the poem Rebirth is Always Painful. In 2012 The New York Times ran an article on zombie poetry. Finally, while doing a bit of searching, I came across this little gem. Woke me up quite late last night. Gave me, well, a nasty fright. I do hope you'll take some time to check out all the wonderful poetic things being shared and collected today by Laura Purdie Salas at Writing the World for Kids. Happy poetry Friday friends! I've frequented some library sales and second hand bookstores recently and have added some lovely titles to my poetry collection. 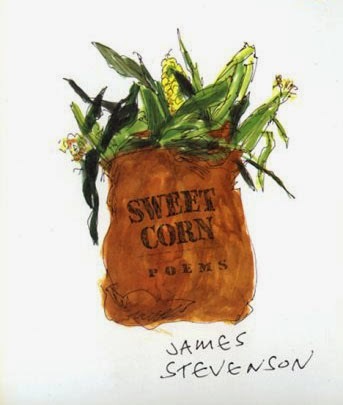 Today I'm sharing two poems from the book Sweet Corn: Poems by James Stevenson. Droplets gather on the green screen door. "Look," they say to one another. "Look how dry it is inside." A few rungs missing at the end. Poem ©James Stevenson. All rights reserved. I do hope you'll take some time to check out all the wonderful poetic things being shared and collected today by Amy Ludwig VanDerwater at The Poem Farm. Happy poetry Friday friends! I've been reading some terrific new poetry books this week, so today I'm sharing a lovely poem from the book EVERYTHING IS A POEM: THE BEST OF J. PATRICK LEWIS. To twinkle life into the town. That thief of art, black-hearted Night. Poem ©J. Patrick Lewis. All rights reserved. I do hope you'll take some time to check out all the wonderful poetic things being shared and collected today by Renée LaTulippe at No Water River. Happy poetry Friday friends! I'm always inspired and a bit in awe when I read a poem that uses the same word in multiple ways. I often wish I were this clever. However, I've begun to think that like many things, getting better is a matter of practice. I'm sure you can think of many words that have multiple meanings. Your challenge this week is to pick a polysemantic word and use it in multiple ways in a poem of any form. I hope you will join me. Please share a link to your poem or the poem itself in the comments. Yesterday I read a post by Donalyn Miller entitled No More Language Arts and Crafts. It struck a chord with me as I thought about how we try to motivate kids to read, and all the ways we get it wrong. First, let me respond to this by telling you about a little rant I usually end up making during the first weeks of the semester. It generally occurs when I teach students how to write lesson plans and we get to the section labeled homework. I've seen a lot of bad homework over the years, as a parent and a teacher educator reading lesson plans. It seems that no one really thinks about why we give homework. What purpose does it serve? How does it advance what you're doing in the classroom? Is it absolutely necessary? Homework should be given because it is beneficial to student learning, and not because it's "school policy." There has been a lot of research done on the effects of homework. One of the best introductions to this is the Educational Leadership piece The Case For and Against Homework. I do tell my students (future teachers) that I think a worksheet with 25 problems is a terrible idea for math homework. I would rather see students solve one good problem and explain how they did it than use rote skills to complete a series of problems that doesn't do much to engage their brains. Also, too many teachers assign homework as practice long before students are ready to tackle the problems on their own. Ultimately, my suggestion for elementary school homework is "Read, play, and puzzle." Read - Reading for homework is a no-brainer, and EVERYTHING and ANYTHING should count. How can we ever hope to build stamina if kids don't sit and read? Kids should be read to and read on their own. Please don't tell me that wordless picture books and graphic novels don't count. You won't convince me that reading David Wiesner's wordless book Flotsam is any less challenging or engaging than a "traditional" picture book with words. Or that the graphic novel The Great American Dust Bowl by Don Brown isn't a masterpiece of history and science, weaving together sourced facts in an accurate historical narrative. Play - Kids weren't meant to sit in a chair all day long. They need time to run, play, imagine, create, and do all kinds of things the curriculum doesn't allow them to do. When kids get home from school the first order of business shouldn't be homework. They should be allowed to run and play outside, ride a bike, walk the dog, catch frogs (if they do that sort of thing), climb trees, and more. They should build with LEGO and GoldiBlox, draw pictures, build train track, topple dominoes, play board games, and more. Play is just as important as structured learning, and kids don't get enough of it today. Puzzle - When was the last time you sat down to solve a puzzle and did it for fun? I do this all the time. Sudoku, crossword puzzles, jigsaw puzzles, logic problems, tangrams ... I could go on. Puzzles are good for the brain. They develop critical thinking and problem solving skills. They teach kids to persevere, guess and check, collaborate with others, and try a whole host of new strategies. Can you think of a better training ground for mathematical thinking than puzzling? Now imagine if your teacher encouraged you to do this for homework. Let me bring this back to reading and how we document what kids do. When I taught middle school science I had a large classroom library. Most of the books were nonfiction of the Eyewitness variety, though I had a lot of books by Patricia Lauber and Seymour Simon. Every Friday one class of kids went home with a book from my library. EVERY KID. There were no reading logs, no book report forms, no AR tests. The books came back on Thursday and each child gave a quick book talk. These were informal. We sat in a circle, they held up their books, gave the title and author, and then gave a general overview and one cool thing they learned. Each student was given one minute. The hardest part of the assignment? Cutting kids off at the one-minute mark so everyone had a chance to speak. I only lost two books in the three years I did this. Kids didn't forget to bring them back. They often wanted to keep books longer than the week. And you know what? THEY WANTED TO READ. The bonus for me was that they were learning a lot of science on their own and from their peers. During the week they had their books there were lots of side conversations about what they were reading. Isn't this what we want? Kids excited about reading and what they are learning? Yes, I think so. I've been working on a series of "homework" bags to share with my classes. The math bags contain a book and a game (with all the materials and directions to play). Homework is reading and play. The beauty is that the play is mathematically oriented, so kids are practicing and reinforcing basic skills. The science bags contain a pair of linked books, usually a nonfiction or poetry title with a picture book. For example, one bag pairs a copy of the book An Island Grows by Lola Schaefer with the book Volcano Rising by Elizabeth Rusch. Where I can include cheap materials and activity ideas, I may just do that. Ultimately, I don't want reading or homework to be a chore. I want kids to be engaged and thinking. I don't believe homework should be given out per some classroom policy, but should be thoughtfully devised and intentionally planned. If we do this, it will make a difference. Sorry I missed you last week, but with the start of the semester here, things got a bit crazy. Yesterday during morning mass and the Prayers of the Faithful we prayed for those who labor and wish to do so. I thought a lot about that over the course of the day and realized how very lucky I am to not only be employed, but to be engaged in work that (for the most part!) love to do. So, this is not very inspired on this day, but I want to write about work and labors of love. I hope you will join me. Please share a link to your poem or the poem itself in the comments.